I dropped off the Teapots 2 quilts today with photographer Gregory Case. I’m pretty dang excited about that! Gregory is a renowned quilt photographer; you may know him as Photo Man on The Quilt Show. I happened to meet Gregory at PIQF last October and I was thrilled when he agreed to take on the photography for my next book. After photography is complete, it goes pretty fast, so Teapots 2 to Appliqué should be out in the next few weeks. I already dropped by and spoke with “my guy” at the printers so he’d put me on the calendar. The first volume of teapot designs, Teapots to Appliqué, is almost sold out of its third printing, and when those are gone, it’ll go out of print (so if you want one, go to quiltpuppy.com sooner rather than later). It’ll be a bittersweet moment, but the sweet part is that Teapots 2 will step right into its shoes with a whole new set of designs. Stay tuned! I’ll let you know the minute the ink is dry. In the meantime, here’s a sneak peak! Designer Susan Brubaker Knapp has posted a wonderful photo tutorial on her blog about how to use Karen Kay Buckley’s Perfect Circles templates to make prepared-edge circles for hand appliqué. I have a set of KKB’s templates tucked away in my appliqué bag of tricks. The circle templates come in a whole lot of different sizes and they come with a ring so you can keep them all corraled. Be sure to visit Susan’s website also, Blue Moon River. 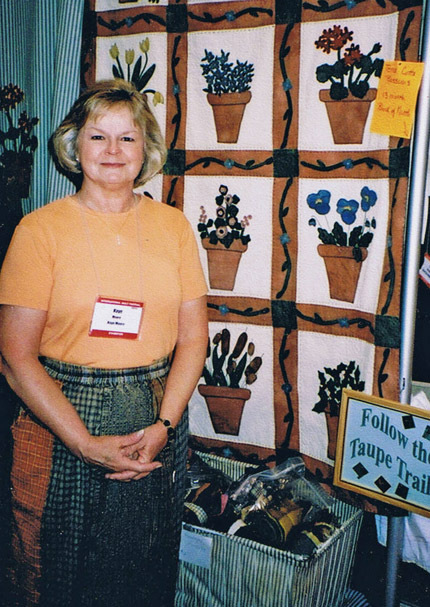 Susan has some beautiful patterns there, including stunning block-of-the-month appliqué patterns. I found this fun photo tutorial on Bethany Reynolds’ website about how to use Stack-n-Whack® to make an appliqué heart! Willie helps me a lot in the studio. Yes, those are teapots… sixteen new ones to be exact. I’m working on my new book, Teapots 2 to Appliqué, and it’s coming right along. Stay tuned! This part of California has been stormy for days. The power at our house has been blipping out so many times that I gave up resetting the clocks! Last night, I was just trimming an appliqué shape when whoops! there it went again. I waited in the dark, and when it didn’t come back on right away, I knew it would be out for awhile. I groped my way to the flashlight and puttered around the house, doing a few things that didn’t require power, but my appliqué was weighing on my mind. All of a sudden I got an idea. I searched the bedside table for a little battery-powered reading light that I’d had for years but had hardly used. Making my way back to the sofa, I stationed my Cut ‘n Press on my lap, set the light on it, turned it on, angled it just right, and there was this bright little pool of light illuminating my work. Now mind you, I had both my contacts in and some reading glasses on, but with this light I was able to go ahead and finish the appliqué block. This one’s called Mighty Bright, and I’ve heard of one called the Itty Bitty Book Light or something like that. Whatever kind you can find, they’re at bookshops, and I found this one quite handy last night. By the way, sending props to those of you who have gone through power outages that lasted days. I salute you! Here’s a photo tutorial on stems and skinny stems, two ways each. That’s four stems! In all cases this is hand appliqué, however, they can be adapted to be sewn on the machine. Here’s how I was first taught to do stems. Cut a bias strip 1″ wide or wider and press it in half, wrong sides together, lengthwise. Mark the stem or vine on the front of the background fabric. Sorry if you can’t see the pencil mark too well… there’s a big storm in California today and there’s no good natural light. Place the folded bias strip over the marked line, kind of averaging its position. Fold over the raw edges to where they fall short of the other side and crease to give yourself an idea of the stitching line. Stitch the vine to the background fabric using a small running stitch (left side of picture). Then roll the folded edge over the stitching, covering the raw edges of the other side. Appliqué the fold down (right side of picture). Disregard the position of the needle in this picture; I laid it down in haste. To make a skinny stem the same way, just stitch much closer to the fold. Trim away the excess, very close to the stitches. Roll and sew the same as before. A pretty good skinny stem. Now, on to the method I use most of the time now, with my trusty green gadget, the Clover® ¼” bias tape maker. Cut a bias strip that is 5/8″ wide. Yes, just 5/8″! Cut the top so that it angles upwards to the left — it seems to feed through better this way. Poke the strip right-side-up into the wider end of the gadget until you can see the fabric in the slot at the top. Use the tip of a pin to pull the strip through the slot until it sticks out the narrow end. Pin the strip to the ironing board. Use a glass-head pin, so you don’t have to worry about melting a plastic pin. Using a hot iron and plenty of steam, pull the gadget along the strip in one smooth, fairly rapid motion, following it closely with the iron. Don’t stop part-way through, or try to back up. Smoothness is key. Important: Hold your iron so that the steam vents are not directed at your fingers. You can make bias strips fusible by applying thin strips of paper-backed fusible web. I do this as a second step. I actually cut the strip of fusible in half lengthwise to make a very thin strip, which I find is enough. The product comes on a roll and is found alongside the bias tape makers. Using a dry iron, press the fusible strip to the back of the bias strip. Remove the paper backing and steam-press the stem over the marked line. Then it’ll be ready to stitch. To make a skinny stem this way, make another bias strip with the gadget, and press one side out flat again. Trim along the crease. Get out your glue stick and run it along the wrong side of the strip. Pick up the strip and pinch the raw edge back over to the center. It should stick with cheerful obedience. It if doesn’t, use a little more glue or make sure the glue stick is fresh. If you prefer to skip the gluing, you can use a hybrid method! Appliqué the folded edge first, then tuck under the raw edge on the other side as you stitch. All four, placed improvisationally on the background and, for some strange reason, from bottom to top! I hope this has helped you if you were looking for information on how to make stems or skinny stems. There are other methods too… remember those cats I mentioned? Over at the Quilter’s Newsletter website, I did a quick search and came up with several tutorials on how to make skinny stems. Check them out as well!